Who was the first person to fly? Now when I say fly I mean sustained, controlled flight in a heavier-than-air aircraft. Was it that snappy dresser from Brazil Alberto Santos Dumont? His countrymen fervently think so. 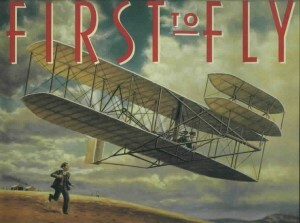 His first flight was on October 23, 1906. It was recognized by Brazilians and by the French and other Europeans to truly be the first controlled flight of a heavier-than-air aircraft. It had the ability to take off from the ground without any catapult assistance and it was witnessed in public by a large crowd and the scientific community. When the Wright Brothers flew in the United States in front of people in general and in front of the press in particular they asked that no photographs be taken. They were very secretive because they were afraid that others would steal their designs or technical features of the aircraft. During the timeframe of 1903 – 1906 they still didn’t have an approved or accepted Patent which also was a factor in their secrecy. Their Patent (# 821,393) was granted on May 22,1906 – three years after they first flew. Then in 1908 they were awarded a government contract from the U.S. War Department ($25,000). They went to Paris on May 29, 1908 and finally demonstrated the aircraft in front of a very large crowd. Was it Gustave Whitehead in Fairfield, Connecticut on August 14, 1901? Eyewitnesses have signed depositions years later attesting to that statement. Modern replicas of Whitehead’s aircraft have been successfully flown. A contract was made between the estate of the Wright Brother’s and the Smithsonian Institution to display the Wright Flyer’ at the Smithsonian (National Air & Space Museum in Washington, D.C.) which stated that if it is proven that anyone else had flown first that the Wright Flyer would be taken back. Conspiracy theorists say that this contract’ was created to keep facts about Whitehead’s alleged flight from being divulged and published. Does a photograph exist showing Gustave Whitehead in flight in 1901? Has the existence of this photograph been suppressed? Controversy to this day still swirls around all these issues. Was it Richard Pearse from New Zealand on March 31, 1903? He had eyewitnesses also. But there wasn’t any photographic evidence of flight. Also Richard Pearse has never said he was the first to fly and he does not want to take away that claim from the Wright Brother’s. The New Zealand Mint struck a silver medal in 1982 to commemorate the: “80th Anniversary of the World 1st Powered Flight”. The date on the medal is: “31-3-1982”. This of course would have made the alleged 1st flight in 1902. The Museum of Transport and Technology (MOTAT) in Auckland which had commissioned the silver medal states on their website that the 1st flight was in 1903. So was it 1902 or 1903? The debate still goes on. Was it Glenn Curtiss? He flew an improved (structurally modified) version of Samuel P. Langley’s Great Aerodrome’ in 1914. So does that mean it could have flown in 1903 before the Wright Brother’s? The ‘Great Aerodrome’ fell off a houseboat in the Potomac River in Washington, D.C. twice in 1903 (October 7th and December 8th). Mr. Curtiss and the Wright Brother’s had Patent Litigation for many years with regards towards “controllable” flight and whose control system (wing-warping or elevator’s and ailerons) was the first and therefore legitimate. Or was it really the Wright Brothers? It has been said that they didn’t really fly on December 17, 1903. Allegedly when Wilbur Wright was running alongside the aircraft he was supposedly balancing he was actually lifting it while his brother Orville Wright was flying’ it. The deep depressions of Wilbur’s footprints in the sand are supposed to be proof of that. Well I was born and raised in Connecticut, but does that mean I have to automatically state that Gustave Whitehead was the first to fly? On the contrary, I emphatically state that I believe that the Wright Brothers (Orville and Wilbur) designed, built, tested, and flew the first heavier-than-air aircraft in sustained and controllable flight. Who knows, maybe someone someday will prove beyond a shadow-of-a-doubt that someone else was first to fly. But until that day comes I am sticking with the Wright Brothers. This entry was posted in Travel and Leisure on February 11, 2014 by admin_z.